JoJo Aragona, Robert Garcia, Emma Myer, Julia Herraiz, Kevin Putsky, Kenna Squier, Camryn Stoner, and Jake Wells each signed their National Letter of Intent to compete and continue their education at a NCAA Division I university. SPARTA — JoJo Aragona, Robert Garcia, Emma Myer, Julia Herraiz, Kevin Putsky, Kenna Squier, Camryn Stoner, and Jake Wells have poured their heart and soul into being top athletes in their respective sports. 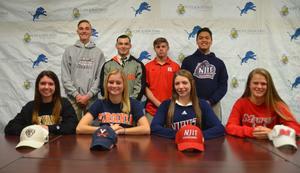 The time, hard work and effort put in by these eight outstanding Pope John XXIII Regional High School student-athletes led them to one of the best moments of their young lives on Wednesday, as they each signed their National Letter of Intent to compete and continue their education at a NCAA Division I university. 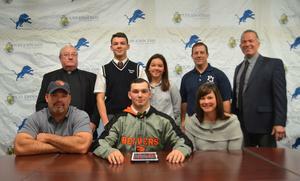 Aragona signed his letter of intent to wrestle for Rutgers University; Garcia signed his letter to wrestle for Oregon State University; Herraiz signed her letter of intent to compete in cross country and track and field for Bryant University; Myer signed her letter to compete in cross country and track and field for the University of Virginia; Putsky signed his letter to play baseball for the New Jersey Institute of Technology; Squier signed her letter to play basketball for the New Jersey Institute of Technology; Stoner signed her letter to play lacrosse for Marist College; and Wells signed his letter to play baseball for St. Bonaventure University. 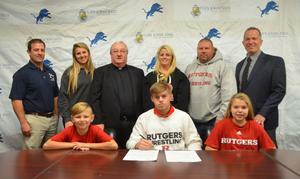 Aragona earned his commitment to Rutgers after being a star for the Lions on the wrestling mat. In three years, Aragona has put together an impressive 116-6 career record while placing in the top three at the NJSIAA Wrestling Championships three times (third at 106 pounds in 2016, second at 120 in 2017 and third at 138 in 2018), winning three Region 1 Tournament titles, claiming three Hunterdon Warren Sussex Tournament titles and two District 2 Tournament championships (2016 and 2018). 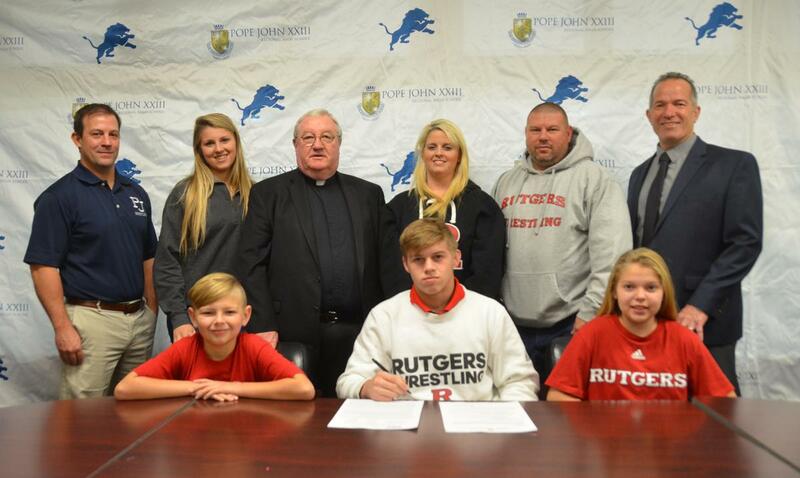 He also helped guide the Lions to a Non-Public B championship, a Non-Public, North B title, two HWS team titles, three NJAC American Division titles and a District 2 team title in 2018. Aragona, who heads into his senior season ranked No. 1 in the country at 138 by FloWrestling and No. 5 in the country at 138 by InterMat Wrestling, was thrilled that all the hard work he completed over the last three years paid dividends. Garcia earned his commitment to Oregon State after also being a key grappler for the Lions during their resurgence as a squad. In his three years, Garcia has gone 103-22 while earning a fourth-place state medal at 132 in 2017, three appearances at the state championships, three Region 1 top-three medals (third at 126 in 2016, first at 132 in 2017 and second at 145 in 2018), and two District 2 championships (2016 and 2018). He not only helped Pope John win its state championship, sectional title, three HWS titles, three American Division titles and District 2 crown, but also assisted them to a 51-8 record in duals in his three years. 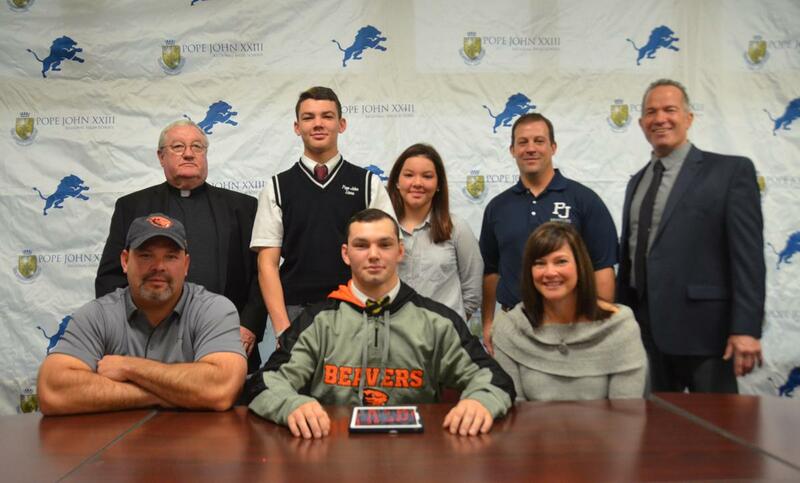 Garcia, who enters this season as one of the top wrestlers in the state and a captain for the Lions, was overjoyed about his opportunity to compete at Oregon State. 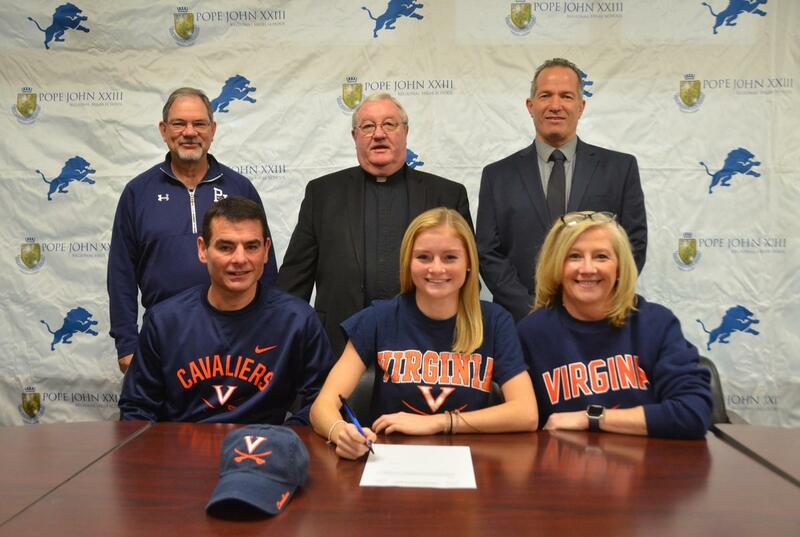 Myer made her commitment to Virginia after being a standout distance runner for the Lions on the trails and on the track. In her four seasons in cross country, Myer has been a two-time Meet of Champions qualifier (2018 and 2016), a two-time top-ten finisher at the Non-Public A championships (eighth in 2018, ninth in 2016), a three-time New Jersey Catholic Track Conference top-five finisher (fifth in 2018, fourth in 2017, fifth in 2016), and a HWS top-ten finisher (sixth in 2018). Myer will run in her final MOC cross country race on Saturday. In three seasons of indoor and outdoor track and field, Myer has been a two-time MOC top-eight individual medalist (fifth in outdoor 800-meter run in 2018, eighth in outdoor 1,600 in 2017), a six-time Non-Public A top-ten individual finisher (second in indoor 1,600 in 2018, second in outdoor 800 in 2018, third in outdoor 1,600 in 2018, third in outdoor 800 in 2017, third in outdoor 1,600 in 2017, fourth in indoor 800 in 2017) and a four-time Non-Public, North A top-ten individual finisher (first in outdoor 1,600 in 2018, second in outdoor 800 in 2018, third in outdoor 800 in 2017, third in outdoor 1,600 in 2017). 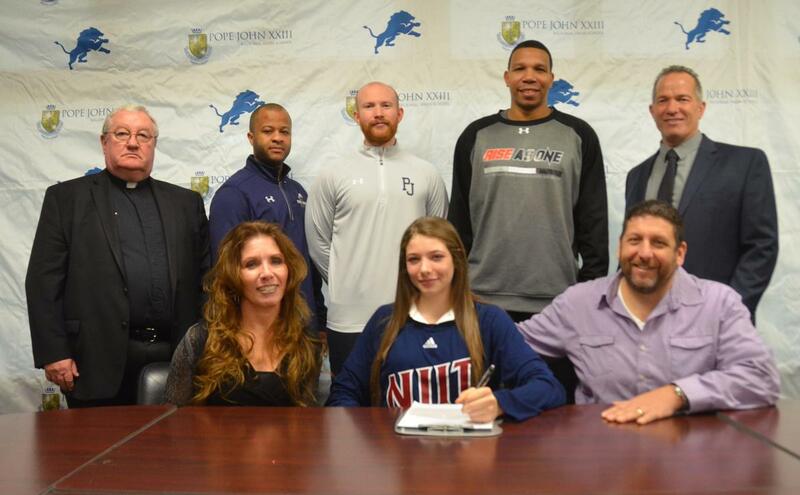 In addition, she has helped the Lions win a Non-Public, North A team title in 2016 and two NJAC American Division titles (2018 and 2017), and aided the Lions to six relay titles (2018 4x800 in Non-Public A outdoor; 2018, 2017, and 2016 4x800 relays in Non-Public, North A outdoor; 2017 Distance Medley Relay in Non-Public A indoor). 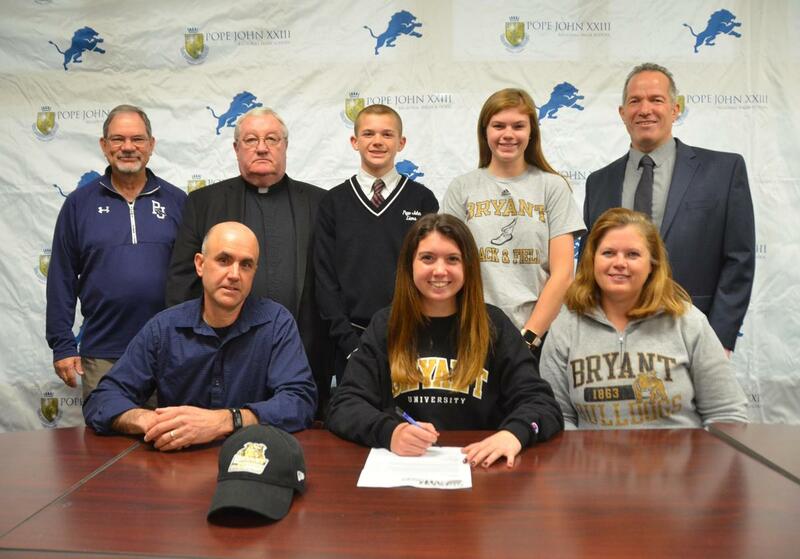 Myer attributed her commitment to not only her hard work, but also the lessons she has learned from Pope John cross country and track and field head coach Brian Corcoran. Herraiz made her commitment to Bryant after also being a strong middle distance runner for the Lions during her career. In her only seasons in indoor and outdoor track and field in 2017-18, Herraiz helped the Lions win two relay titles (2018 4x800 Non-Public A 4x800 outdoor and 2018 Non-Public, North A 4x800 outdoor). In her two seasons of cross country, Herraiz was a HWS top-ten finisher (10th in 2017) and an All-NJAC American Division second team selection (2017). Herraiz, who has her final indoor and outdoor track seasons coming up, was happy to know that her dedication to running got her this chance to take her talents to the next level. 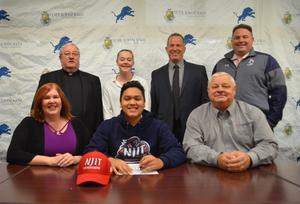 Putsky put his name down to go to NJIT after being a top-notch baseball player for the Lions on the diamond. In his two seasons for the Lions as an outfielder, Putsky has registered 41 hits with 33 RBI while batting .258 in 159 career games. More importantly, he has helped the Lions go 39-19, win two NJAC American Division championships, claim one HWS championship, earn two Non-Public, North A playoff appearances, and reach one Non-Public, North A final in 2017. 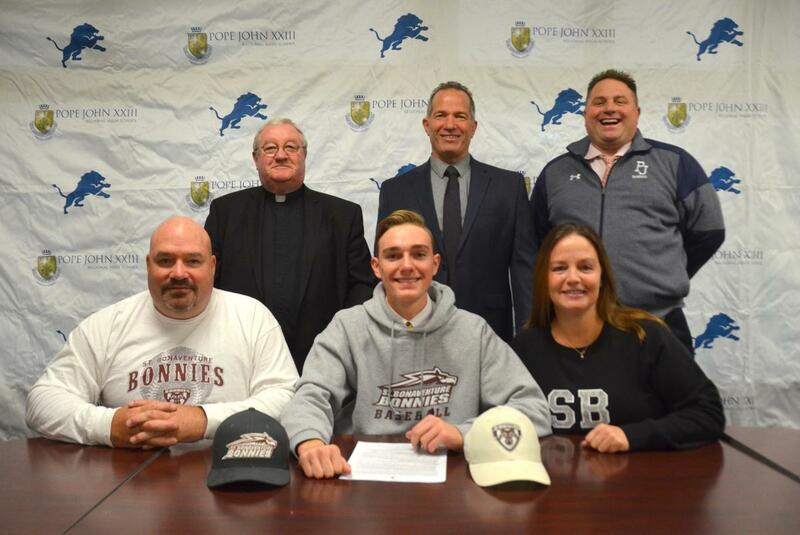 Putsky, who will play his final season for the Lions in the spring, was ecstatic to know that he will get a chance to play at the next level after going through great lengths to become a quality baseball player. Squier will go to the same school as Putsky, but she is taking her talents to the basketball court after being one of the best in the state on the hardwood. In her three seasons with the Lions and Sussex Tech (where she spent her first two years), Squier has amassed 1,399 points and averaged 19.2 points per game in 73 career games. She has also recorded a 37 double-doubles and five triple-doubles, with 22 of her double-doubles and three of her triple-doubles coming last season while leading the Lions to a 15-13 record and a Non-Public, North A quarterfinal appearance. Squier, who begins her final high school season in December, felt overjoyed about her commitment because of the road she took to get to this point. Stoner signed her name to attend Marist after having a great three seasons as a midfielder for the Lions’ girls lacrosse team. Since stepping on the field for the Lions, Stoner has racked up 193 ground balls, won 69 face offs, and scored 98 points on 67 goals and 31 assists. In doing so, she assisted the Lions to 32-25 record, one North 1, Group 2 semifinal appearance, three North 1, Group 2 playoff appearances and two HWS quarterfinal appearances. 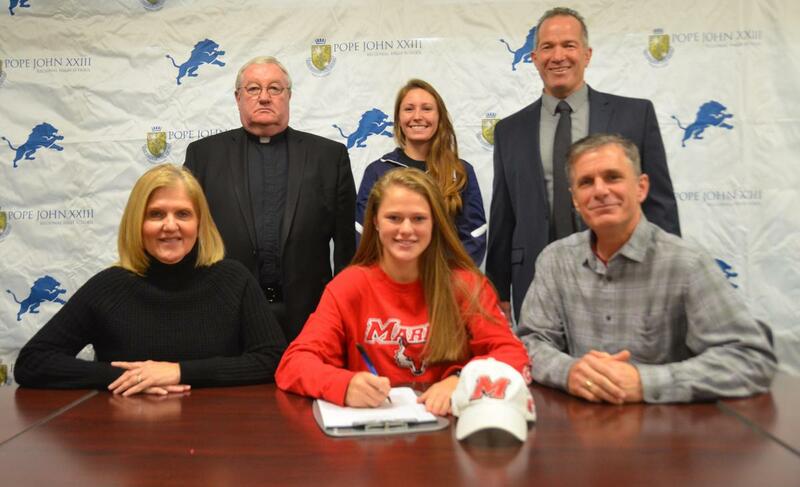 For Stoner, she was thrilled to make this commitment official after having been verbally committed to Marist since she was a sophomore. Wells signed with St. Bonaventure after being one of the best pitchers for the Lions for the last three seasons. On the mound, Wells has posted a 17-9 record with a 2.29 ERA and struck out 135 batters while walking only 44 in 145 1/3 innings pitched. Moreover, he has helped the Lions go 54-34, win two NJAC American Division championships, capture one HWS title, earn two Non-Public, North A playoff appearances, and reach one Non-Public, North A final in 2017. Wells, who will play for the Lions one last time in the spring, was happy to make his commitment and achieve one his goals on his way to trying to reach his ultimate goal of being a professional baseball player. For more pictures from Pope John's Fall Signing Day, click here!